Note: This post has been amended with additional information provided by readers. 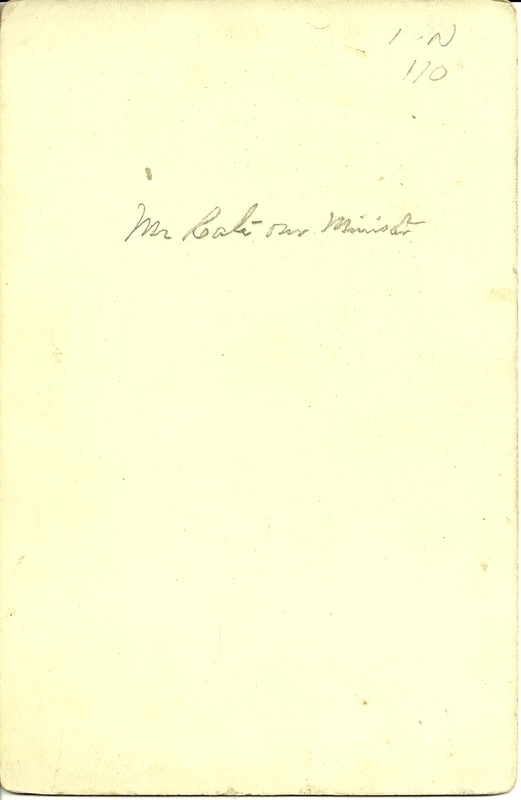 Cabinet photograph of a man identified on reverse as "Mr. Cate, our Minister". The photograph was taken by the Anderson Studio of 60 Merrimack Street, Haverhill, Massachusetts. From comparing photographs, I believe this is Isaac Wallace Cate, a minister at various New England parishes and a missionary to Japan, who, along with his wife Ella Gertrude (Stimson) Cate, became a noted authority on Japanese culture. Here is a printed photograph I found of him, when he was perhaps ten years older than in the photograph above. 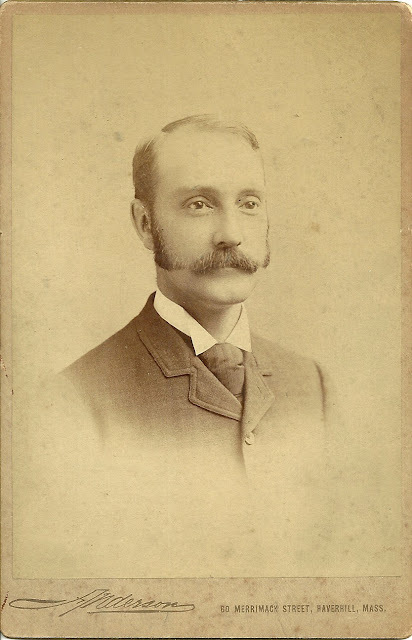 Isaac Wallace Cate, who went professionally by the name I. Wallace Cate, was born 30 July 1862 at Calais, Vermont, the son of Lemuel McKnight Cate and Jerusha (Pitkin) Cate. I. Wallace married Ella Gertrude Stimson in 1892. She was born in Boston in September of 1865, the daughter of Royal D. and Annie (possibly Mareen or Richardson) Stimson. Note from a descendant: Ella Gertrude (Stimson) Cate was a woman of accomplishment herself, having acquired a Master's Degree during the 1880s; she was able to converse in a variety of languages and held salons in Japan, attended by the intellectual, industrial and political elite. Esther Safford Cate, born in July of 1892 in Japan; a teacher in Vermont and Connecticut; died 1982 in Meriden, Connecticut. She was a social activist; was convicted of sedition for advocating for the Japanese internees during World War II. Weston Attwood Cate, born 27 February 1894 in Japan; Universalist pastor in Maine, Massachusetts, New York and Vermont; married Arlene May Jeffords; their son Weston Attwood Cate, Jr., was a prominent Vermont educator; Weston Sr. died in 1962 in Vermont. Paul Stimson Cate, born 9 March 1900 at Machias, Maine, where his father was a pastor for a time, between his trips to Japan. Paul married Masuko Hirai in Japan where they lived; they divorced when relations soured between the United States and Japan, and Paul returned to the United States in 1939. In 1940, he married his stenographer, Dorothy Edna Olmstead. They both worked for the U.S. government, Paul on a team that decoded Japanese messages. Paul died from illness in 1942; his widow went on to work for Generals Eisenhower and Bradley. Philip Harding Cate, born 25 August 1902, in Japan; worked in the Oriental Shop in Nashua, New Hampshire with his mother and was involved in the exhibition of Japanese art; he married twice, possibly three times; he died in Hawaii in 1997. During World War II, he worked for Naval Intelligence, though a relative relates that it pained him to do so as he had grown up in Japan and had many childhood friends there. Ione Chidzuko Cate, born 18 November 1906 in Tokyo, Japan; was a teacher in Turkey; m. Clarence Nelson; died in 1995 in California or Colorado. At least two of the children graduated from Goddard Seminary in Vermont, their father's alma mater. Isaac Wallace Cate developed an illness in Japan and was on his way home to the United States when he died on board a ship off the west coast of New Zealand, on 11 May 1908. His widow Ella returned to Japan where she taught until her retirement in 1928. She and her son Philip operated the Oriental Store at Nashua, New Hampshire. She died in 1938. If you have any corrections and/or additions to the infomration above, please leave a comment or contact me directly, so that I change or add information for the benefit of future readers. Thanks! An archive of the papers of Isaac Wallace Cate and some of those of his wife and children are held at the Andover-Harvard Theological Library of Harvard Divinity School. A Vermont history site has brief biographies of Isaac Wallace Cate, his wife and children. It's amazing how a photograph purchased at an antique mall can lead to such an interesting family. Thanks for this helpful information. I would like to add some info about Paul Stimson Cate. He married my Great Aunt Dorothy Edna Olmsted on 14 Mar 1940 in Alexandria, Virginia. She was his stenographer. They both had 3 years of college. He had his thorough knowledge of Japanese. They worked for the War Department in Washington D.C. He was in the group that decoded/translated Japanese messages. Years later, Dorothy told us a little about his work. The family new that she was heartbroken when Paul died at so young an age on February 10, 1942. She went on to work oversees in Cairo, Paris, and London as an executive secretary to generals and colonels. She worked for General Eisenhauer while he toured Europe. She also worked for General Bradley among others. She remarried after retiring in 1968 to Colonel Robert Hoover Calahan.